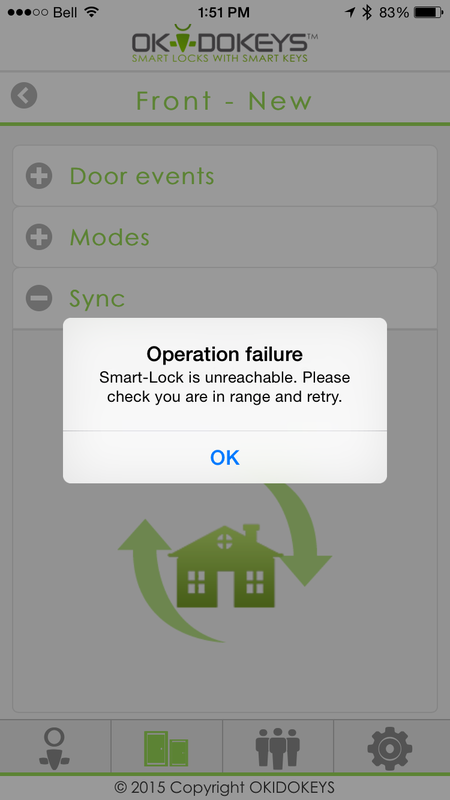 That’s what I’d been hoping for when the Okidokeys Smart Lock arrived on my doorstep. But, much to my disappointment, that wasn’t quite what I got. The Okidokeys kit looks simple enough, and the instructions seemed straightforward. It comes with the automatic lock mechanism, 3 different colours of back cover, batteries, (4 AAs) and the tools needed to install it. The instructions says to just remove the back of the deadbolt from your door, leaving the rest of the locking hardware in place, slip the Okidokeys motorized locking system over top, screw it in, and voila! Except that’s not at all what happened. Replacing the back of the lock with a new plate. 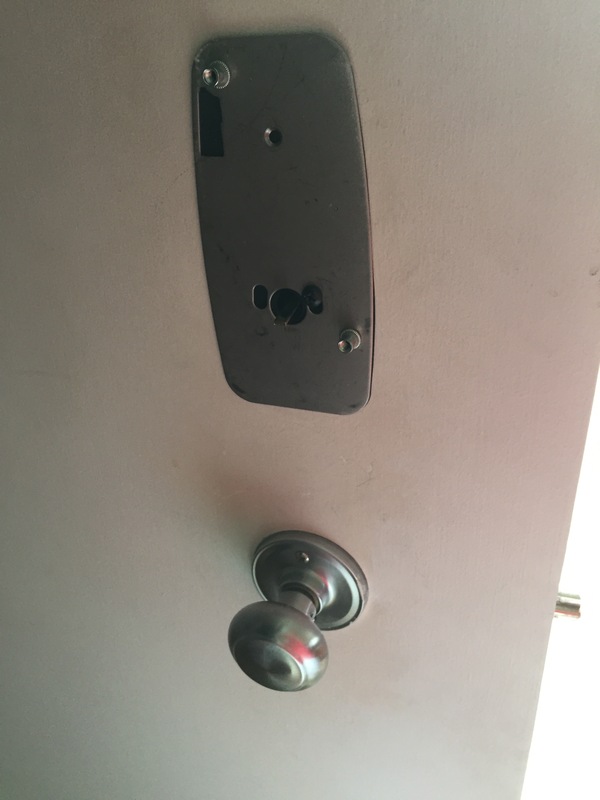 While all you need is a screwdriver to do the installation, and it doesn’t mark or ruin your door, Okidokeys did not fit over top of my existing lock. Some adapters are included with the kit, but none of them seemed to fit right. No matter which I used, the lock would not sit flush with the door. Finally I realized the correct adapter was included with the package, but it did not fit properly on our lock; the deadbolt post was just too long. When I called customer service for assistance, I got a rather surly woman, who finally told me the only way around this was to buy a new deadbolt, or to try to file the lock bolt mechanism down so the Okidokeys lock would fit over top of it. Not wanting to go out and buy another lock just so this new lock would work, I eventually located a file and spent a good amount of time grinding down the post. It was a lot of work, extending the installation by a good hour. Once the installation was done I downloaded the app for iPhone 6. Except then I found out you can’t download the app and sign up for an account on your phone. For that you need a computer. Once the account was set up on the laptop, I signed into the app using my newly created account, and nothing happened. while the app loaded, there appeared to be no way to actually tell the app which deadbolt I had. Plus, when I manually engaged the lock, it made a horrible loud grinding sound. After another frustrating 45 minutes trying to sort that out, trying to get the deadbolt to connect to the phone, I put the whole thing away for the night to resume in the morning. Turns out the next day it was no easier. I went through all of the set up again but had no luck getting anything working. I finally decided to call the Okidokeys support line again. The customer service rep could not seem to figure out what the problem was and said she did not know what was going on, and I was kind of left hanging. What was I supposed to do with a non-functional lock, and someone who was out of ideas to help me? I asked to speak to a supervisor or someone with more detailed tech-support background to help me, as I felt that “I don’t know” was not an adequate customer service response. Instead, the CSR asked me to email her a still photo of the lock, to prove it was mounted flush against the door. I declined, because it was flush, and because I was getting anoyed at the non-functionality of the unit.. In the end I left a message for a supervisor to call me back at the first available opportunity. In the meantime, I uploaded a video to Twitter of my problem, and hoped someone would be able to help me. Turns out Okidokeys is monitoring their Twitter account rather well (kudos), and within an hour they had called me back to say they had seen my video, and thanks to that they could tell the lock itself was malfunctioning. They offered to send me a new one right away. Meantime, I decided to get my account set up and ready for when the new lock arrived. Once signed in to the company webpage on a desktop computer I was able to get logged in and get started. I finally figured out you need to put in the serial number of the lock on the computer (not your phone, again). One small frustration with this is that I went through the process of entering the serial number, door name, door time zone, and a picture to apply to it, but I chose not to select the optional “door group name”, and when I went to click “next”, it gave me an error message for not picking a door group name, and it had reset half of the settings. Annoying since I had to go through and re-set up the lock all over again. Once that was done I was able to start assigning people to use the door. That process is fairly straightforward you can give certain users a key tag, wristband, or plastic credit card style key, and then you can then assign certain hours of the day they will be able to swipe their ‘key’ to open your door. Setting up the smart keys, like the included key tag, the credit card key, and the wristband, was easy, thankfully. You simply go to the drop-down menu on the website for smart devices, register smart tag using the serial number that is very clearly printed on the smart tags, and you’re good to go. Then it’s as easy as creating new user profiles, and assigning those people whichever keys you want them to have. When the new lock finally arrived about a week later, I was already very similar with how to install it, so it went quickly. When I did the self test, everything worked smoothly and the lock was able to turn on it’s own quite easily with no grinding, although the lock is quite loud. Then I decided to try locking the door with the app. The app told me that I first needed to ‘sync’ the door to the app. Trying to get the lock to sync took about six attempts, before it randomly worked. Then I tried locking again, but kept getting an error message that I was not standing near enough the door, when I was probably about a foot and a half away from it. Then I tried to manually lock and unlock the door using the buttons on the back of the door lock. That didn’t work either, although I got a helpful looking blue light each time I tried. I decided to close out of the app and restart it in hopes this would jazz things up a bit. Only then to my frustration I realized I needed to log in again. But when I tried to do that I kept getting an error message saying my login credentials were invalid. At this point, admittedly I was ready to throw the damn lock out the window. To me, a product should not be this hard or this frustrating to set up. Fortunately, after another attempt at logging in I got back into my account. This time when I went to lock the door using the app it worked! Hallelujah! Bt my joy was short-lived. The next time I tried to lock the door, I got an ‘operation timeout failure’. I decided to do an experiment and standing next to the door I tried to lock the door or unlock it ten times from a couple distances. The lock only responded four out of those ten times. This is an enormous frustration. No one has time to stand around in front of the door holding loaded bags of groceries waiting for three or four attempts at unlocking the door before it listens. It’s also worth mentioning that the lock, when it actually functions, takes a long time to engage and open. I timed it, and on one occasion when trying to unlock the door it took about 26 seconds before the lock would finally respond. Again, I could have unlocked the door in about two seconds flat with the old fashioned key in that time. At this point I was pretty much done with this device. But I decided to give customer service a call one more time to see if perhaps there was something strange going on they could easily remedy. Alas, it was Saturday, and Okidokeys voicemail hopefully told me that their customer service office closes at 2 PM MT on Saturdays. Great. Later on, feeling optimistic, I decided to try to use the app to lock my door when I left. When I went to load up the app, it wanted me to login from scratch again. Uggghhhh! Turn On Automatic Login, for gosh sakes! Another constant frustration was the fact that I needed to input the username or email and password to access the app every time I tried to use it. Making that even more frustrating, is despite entering the username and password correctly at least half a dozen times, I kept getting an error message saying that the ‘user is invalid’. When I left the phone to sit for a few minutes, and tried again by simply hitting ‘enter’ on the information I had already put in, for some reason it would randomly allow me access. Very frustrating. Eventually I figured out that by turning on “automatic logins” in the settings menu in the app, I could forgo logging in every single time I wanted to use it. Also, in what almost seems like too much security, every time I logged into the Okidokeys webpage on the computer to access my account, it emailed me a security code that I had to input before I was able to login. More steps, more frustration. Another thing I found frustrating about this lock set was that there’s no way for me to open the door from a remote location. It would be so handy if I could let the cleaning lady, neighbour, or even a key-forgetting spouse in from my smartphone kilometers away in my office, but that’s not an option. To let someone else in if I’m not at home (and have not given them a key previously), they’d need to download the app, and I’d have to email them access permission. But since getting the account working in the first place was such a hassle for me I was not comfortable foisting it on someone else. It would be great if I could just press a button on my phone from far away, and the lock would open for whoever I needed to let in. But alas.. no. Okidokeys also says it has a Hands-free Mode where it will unlock your door when your cell phone gets close to it, but (noticing a pattern?) I couldn’t get that to work either. 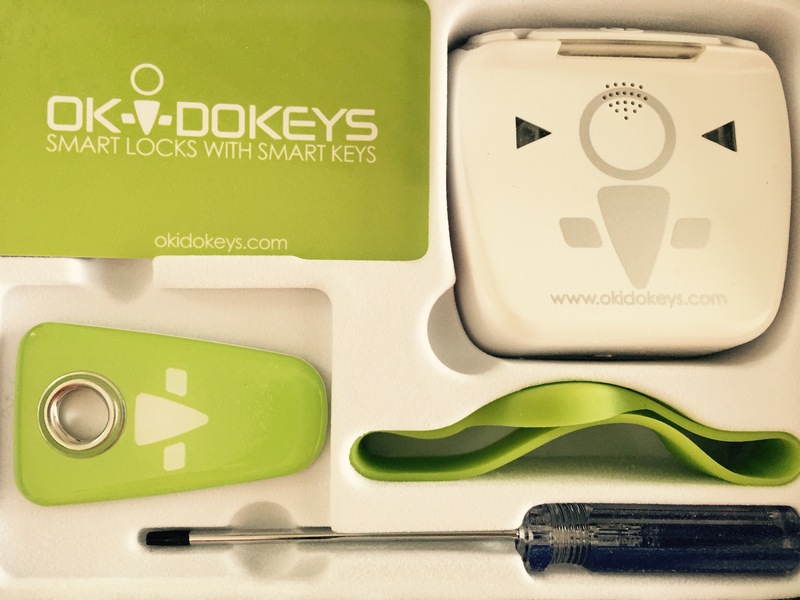 The Okidokeys Smart Lock was not easy to use. In my experience it was buggy and unreliable, and took far too long to perform the simple task of unlocking the door. I’m not going to fault the first lock for being a dud, but I also didn’t have great experience with Okidokeys customer service folks on their phone help line. Having tried some products like the Ring Video Doorbell recently, or the Nest Learning Thermostat which worked perfectly from the moment the box was opened (and reliably from then on), this product appears not quite ready for use by an average customer. It’s just too frustrating. I’ll be interested in seeing further software updates, but until then, it’s back to using my key.